Example of AirPlay Mirroring scaling issue with OS X 10.9.2 as seen on an HDTV with connected Apple TV. Multiple readers have reported similar issues to those described by the Support Communities' forum members, many of whom have seen problems with AirPlay Mirroring in OS X after updating to OS X 10.9.2. Apple released the latest Mac operating system version on Monday to patch a variety of issues, including an SSL security flaw, erratic Mail behavior and SMB2 reliability. The update also added FaceTime Audio calling and iMessage user blocking. According to one of the larger forum threads, titled "Airplay mirroring broke in 10.9.2," users are seeing a host of different failures. 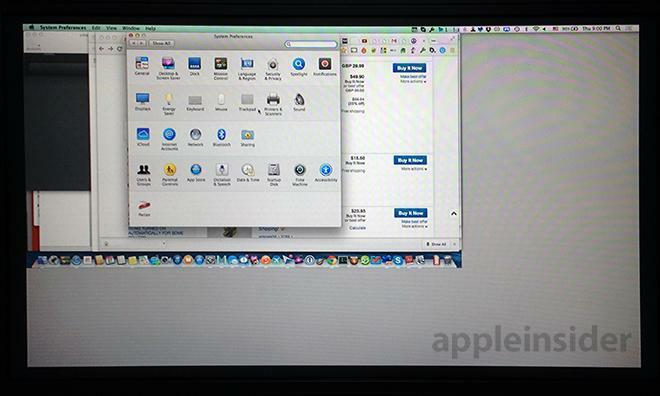 For example, one user found AirPlay Mirroring was no longer a selectable option in the AirPlay menu. Others have been able to connect to their Apple TV, but only audio is passed through in these cases. In addition to the mirroring faults, users detail problems wiAirPlay's desktop extension function. The thread is one of a handful detailing OS X 10.9.2 AirPlay issues and has drawn 18 replies with over 660 views. AppleInsider was able to reproduce a few of the described issues with a mid-2011 MacBook Air and third-generation Apple TV, which are running OS X 10.9.2 and Apple TV Software Update 6.0.2, respectively. We experienced scaling issues on both the Mac and Apple TV, low frame rates, sporadic mouse freezing and video failures. After performing a hard reset on all devices, including the wireless router, operation continued to be unstable to the point of being unusable. In another test with a late-2013 MacBook Pro and third-gen Apple TV, however, all AirPlay functions worked fine. While mere speculation, the impromptu tests suggest OS X 10.9.2 may have AirPlay compatibility issues with older Mac hardware.